Store your favorite keepsakes and other large valuables in this 46 Quart WEATHERTIGHT heavy-duty storage tote. The WEATHERTIGHT seal on the storage bin lid protects contents by keeping air and moisture out. 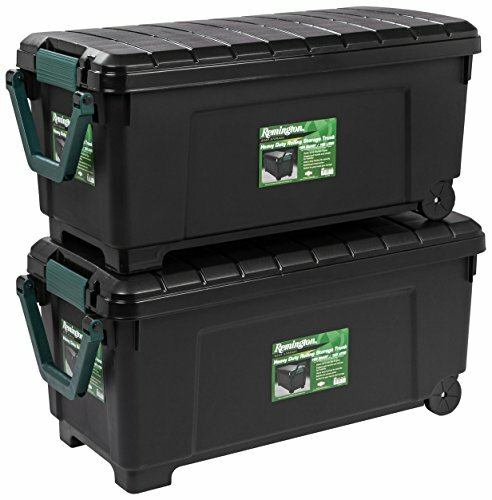 Safely store up to 40 pounds of material, such as crafting supplies, camping gear, or clothing in these big storage bins. 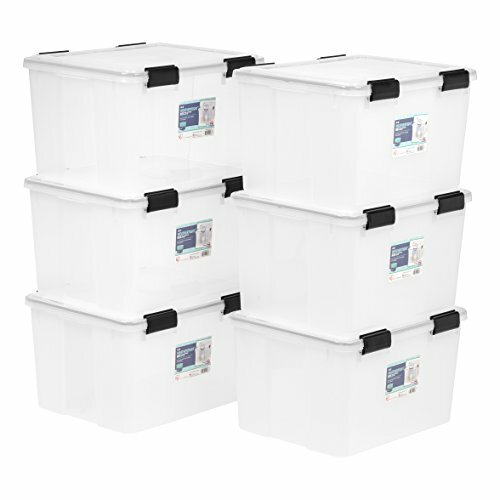 The grooves in the reinforced lids means these 46 quart stackable totes with lids can be placed on top of the 30 and 46 quart IRIS tote boxes to save space and create a customized storage solution. See other items in this family: 6.5 quart, 19 quart, 30 quart, 41 quart, 46 quart, 62 quart, 74 quart, and 103 quart WEATHERTIGHT heavy-duty storage totes. Made in the USA. The Storex 4 Gallon (15L) Classroom Storage Bin is the ultimate companion for your bookshelf or cubby. The bin is made of impact resistant plastic and comes in wonderfully bright colors. The easy to grip handles are perfectly sized for big and small hands. Use them to organize your room and store your supplies. The inside of the bin is 11" long to hold letter size papers and workbooks. Black, case of 6. Storex is committed to providing a stylish, quality product. Storex - Built to function, designed to impress. The modular storage bin system built to meet your needs. 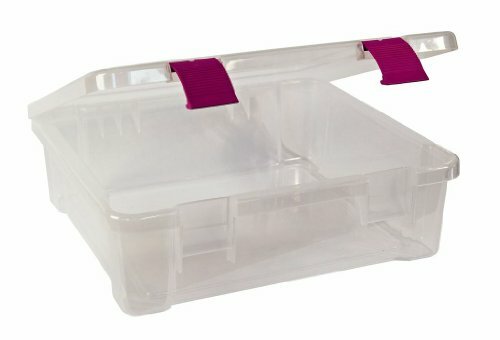 This 5 QT Stack & Pull™ storage box easily stores shoes, craft supplies, office supplies, and more. Sturdy buckle up latches keep the lid securely in place, and the built-in handle makes it easy to pull the box off of a shelf. Storing boxes stack neatly with other units in the Stack & Pull™ series. Available in multiple colors. Made in the USA. The new heavy duty file tote from Storex holds either Letter or legal sized hanging file folders. It includes a flip open lid which allows you to take a quick look at the files and contents inside. Our patent floating rail system makes the totes easy to pull apart while accommodating a full load of files. Holds up to 50 lbs. Clear base and opaque hinged lid. Stackable up to 6 units high. Storex is committed to providing a stylish, quality product. Storex - built to function, designed to impress. Our Remington Store-It-All Rolling Tote with Handle is the ultimate heavy-duty storage solution. Conveniently transport tools, sporting and hunting gear, gardening supplies, and more with a reinforced pull handle and wheels. For added security, the tote can be locked with a pad lock or zip tie. It's a perfect organization system for any garage or basement. Sold in a pack of 2. Store your important documents in this Advantus File Tote with Lid. 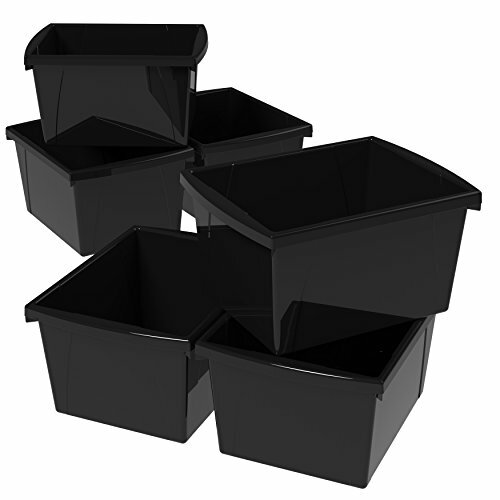 This black plastic file tub measures approximately 19 x 15.5 x 11 inches externally and holds up to 15 inches of letter-size files or 11.5 inches of legal-size files, making it a versatile file storage option for all types of offices or work environments. Each Advantus File Tote has molded-in handles for easy transport and a snap-on lid with built-in rails for easy stacking. It can also fit easily under desks and tables, or onto a storage shelf for quick and easy file retrieval. Advantus Corp. is dedicated to providing innovative quality products at fair prices. Organize your favorite music, movies and games in this media storage box. The tote with lid holds up to 120 standard jewel CD cases or 50 standard DVD cases. 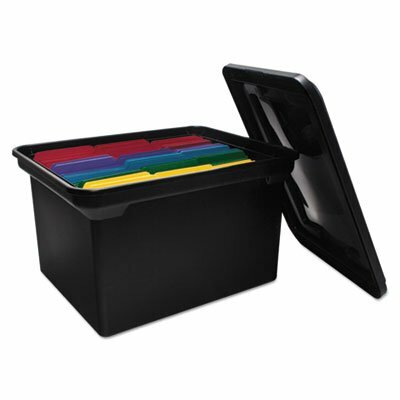 Stackable plastic storage bins maximize your storage space and keep CDs and DVDs protected from dust and breakage. 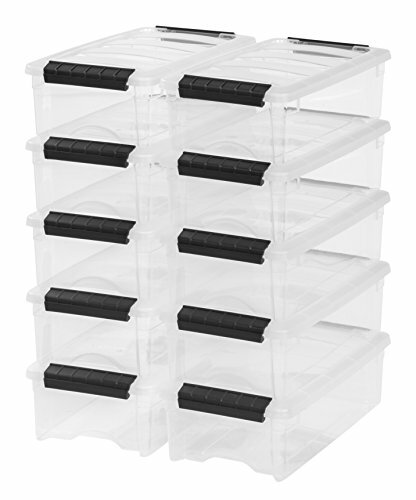 Use three removable dividers to customize the container box to fit your storage and organization needs. The clear plastic tub makes it easy to identify contents within, while a snap-tight lid keeps them secure. Easily store the tote bin under the bed to save space. 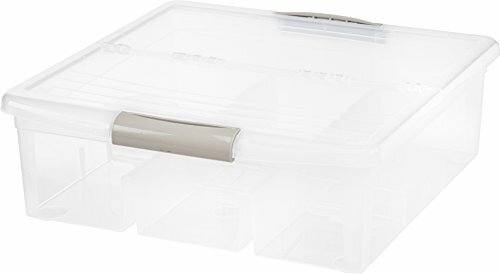 Not only great for storing DVDs, CDs and video games, this IRIS storage box can also be used for storing books, crafting supplies, holiday decorations and more. Organize files and office essentials. Clear design lets you see stored materials. Wheels for easy transport. When stacked, wheels of top box fit into grooves on lid of bottom box to prevent falling. 23-3/4w x 15-3/4d x 15-3/4h. Creative Options brings you organizers for every nook and cranny of your craft room. Their innovative, versatile products in fashionable colors and prints help to make organization chic and storage stylish. The sophisticated palette will inspire you to try new and exciting projects while keeping your supplies organized and your mind free so you can unleash your creativity. You might just find the beginning of something beautiful. This molded organizer is a practical storage solution with a touch of style. It is great for holding your craft or DIY supplies making organizing easy and never boring. 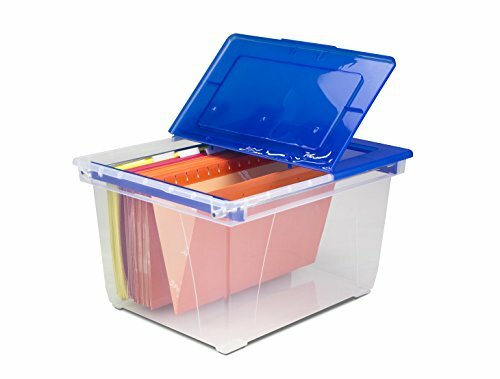 The 708-082 Molded Storage File Tub - Project Organizer and Album Storage with ProLatch Locking System measures: 16.00"L x 17.25"W x 5.25"H.
Looking for more Files Plastic Storage Tubs similar ideas? Try to explore these searches: Deluxe Gift Set Lavender, Mississippi Barbeque Sauce, and 1521 Lcd. Look at latest related video about Files Plastic Storage Tubs. Shopwizion.com is the smartest way for online shopping: compare prices of leading online shops for best deals around the web. 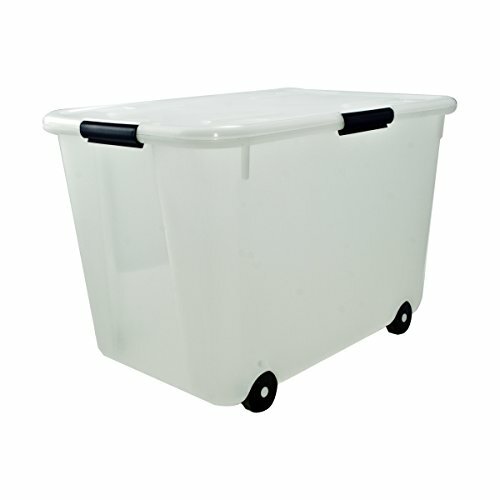 Don't miss TOP Files Plastic Storage Tubs deals, updated daily.